Hershey kisses form the face of chocolate-dipped maraschino cherries with stems sandwiching almond slivers for ears. My bee buddy David turned 70 years old this year. To celebrate, his sons joined him for a weekend of fine dining, theatre and catching up on family stories, including a chocolate birthday cake with white icing decorated with, what else – bees. There’s another passion in David’s life, besides his lovely wife. Three cats have found refuge at David’s house, each with a story sadder than the next one until you see them today, coats shiny as they happily lounge on the grass outside David’s basement office. There is Shirley, a one-eyed calico suspected of being at least 18 years old who is the self-designated house greeter. Chatty Shirley will let you know it’s time to pick her up when she rolls over after telling you all about her day. Then there is black Henry with yellow eyes, who hides from most people but who talks to me, especially when he wants inside the house. One time he led me to all house doors to see if I could let him inside. Unfortunately I didn’t happen to have a key and he let me know what he thought of my shortcomings by dashing off. Finally, there is black and white Smokey, who played hard to get for 3 years and now won’t let David, or Henry, out of his sight. I, on the other hand, Smokey can easily do without and tries to, every time he sees me. 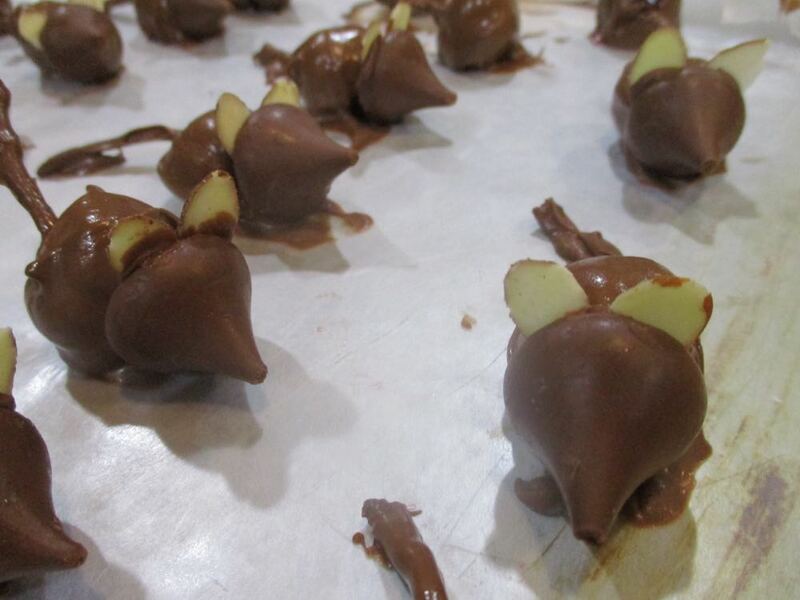 When I heard about David’s landmark birthday, I knew the furry family had to contribute – actually Shirley asked me, she has a lot to say every time she sees me – so I made one of my favorite gift treats, chocolate mice. Drain maraschino cherries and place on paper towel. Unwrap Hershey kisses. It's okay to test them for freshness. Melt dark almond bark in microwave for 1 ½ minutes until melted. Dip maraschino cherries in chocolate until covered; place on wax paper to dry. Add dab of melted chocolate to flat Hershey kiss; add 2 Almond slivers. Press against cherry. Allow to dry. To make these even more special, I packaged them in a tin container. Make sure the tin is tall enough not to break the almond sliver ears. If you want to make sure they don’t move, you can use a tiny dab of chocolate to “glue” the mice to a cardboard bottom. For fun, I added three catnip mice to the tin instead of a ribbon. The gift card was “signed” with the three cats footprints, a cat foot print stamp my cats have been known to use for their gift-giving. I added names just in case David couldn’t distinguish between one set of prints against another one but he seemed to know who had contributed to the birthday sentiments without my saying another word. These also make wonderful Christmas and Halloween treats. Trick or treat! You've seen these made out of celophane, I like to make them out of fabric scraps! We are getting close to Valentine's Day, a holiday represented by roses if there ever was one. The first Hershey Kisses rose someone gave me was made out of clear celophane. I loved the idea so much I took it home to use as a template to use up some of my fabric scraps. Although with fabric it's not easy to know what is inside, I found an easy way to make that clear. a 3"x5" fabric piece per flower; select a light or medium weight fabric. I cut out some green leaves out of fabric, which worked well when I ran out of pre-made ones. To make, glue two Hershey Kisses bottoms together. I like to mix a hug with a kiss or two hugs. Depends on the message you want to send so I will leave what kind of Hershey chocolate you sue up to you. Insert cooking skewer into one end. If you use a light fabric that is green for leaves, you may need to spray with starch and iron to keep the leaf from falling over. Place other Hershey Kiss end into center of fabric and wrap fabric around the Hershey chocolate. I add the little Hershey id paper to the outside before wrapping with floral tape so the recipient knows what is inside. 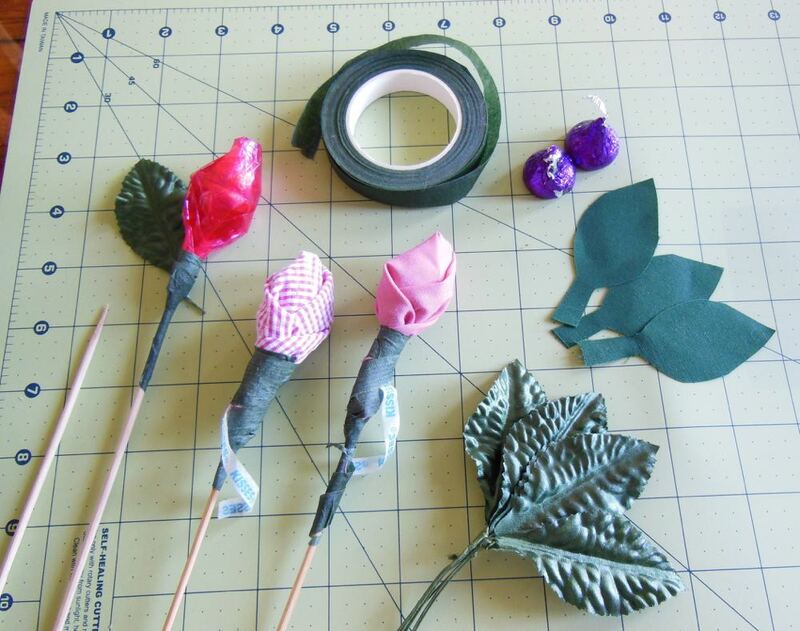 Add a leaf and wrap floral tape around the bottom. Add a gift card and deliver with love! A bouquet is nice but the single flowers are even nicer, especially if you add a little personal card. Fun to make and even more fun to give! Alex Pizza bahklava topped with Greek Farms, Rolla, Mo. honey but there's more to serving this. One of the perks of hosting monthly beekeeping meetings is that people bring in goodies to share. One delicious offering comes from Mike Samaras with Alex's Pizza, Rolla, Mo., one of our beekeeping students now selling honey at his Greek Farms. Now I have enjoyed homemade bahklava off and on over the years but it's not a dessert I have seen mentioned how to best serve in Missouri cookbooks. Mike said the best way to enjoy this pile of filo dough layers filled with chopped nuts is to drizzle honey over the top. Already rich to my taste, adding honey seemed unnecessary but I tried it. It was delicious. Then Mike said and the other part of how to serve this desert is to add a sprinkling of cinnamon. A piece of Alex Pizza bahklava served drizzled with honey and a sprinkling of cinnamon. Yumm! I took a piece of bahklava home, added a drizzle of my own honey and sprinkled with cinnamon. The cinnamon helped cut some of the richness and gave the combination a more subtle taste. Still wonderful and rich. Thanks for the tip, and the delicious bahklava, Mike! One of the many things I enjoy about the holidays is taste-testing dishes. 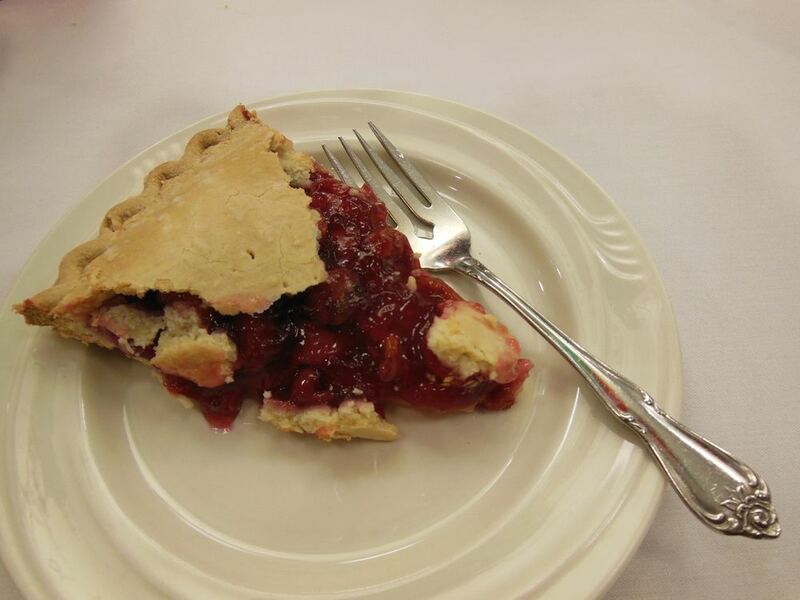 At a community lunch December 2015, we were offered two choices: a regular cherry pie and a sugar free cherry pie. As a fan of cherries of all kinds, my friend Ina and I decided to run an ever-not-so-scientific study to determine if there was a difference in the taste of the pies. Maybe they used an artificial sweetener, we surmised. Perhaps the filing had honey, or they used different cherries. There was no end to our speculation of what the difference was in these two delectable desserts. We tested these two cherry pies: sugar free on the left, regular cherry pie on the right. Once we had fork in hand, we analyzed the most controversial part of a pie, the crust. It was flaky without being dry. Excellent start. Next bite, one from the sugar free cherry pie. SUGAR FREE CHERRY PIE BEING Taste tested against a regular cherry pie. regular cherry pie with a sugar topping as the second taste test subject. Any guess of what we found? The cherry pie fillings were the same. The only difference between the two cherry pies was that the regular cherry pie had an egg wash and sugar sprinkled on top and the sugar free cherry pie did not. Did I miss the sugar topping? Absolutely not. Actually I preferred the cherry pie without the sweet topping. Good thing since that was the slice of pie I chose to finish! Sometimes you want something sweet to end your meal and these nutty treats are easy, and fun, to make. Using mini-vanilla wafers, add a dab of melted chocolate to the bottom. Attach a Hershey kiss. Once dry, use a toothpick to dab a tiny stem on the top. 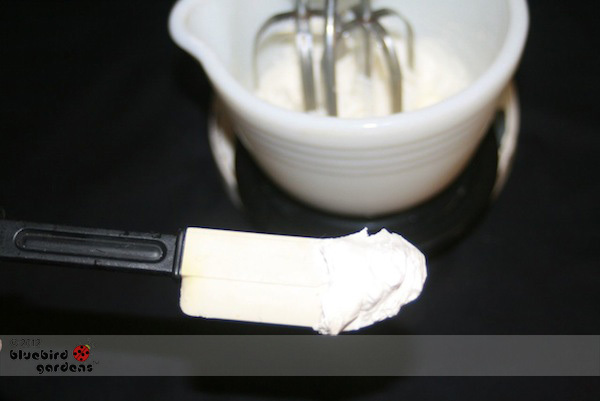 Takes 5 minutes from start to finish and adds charm to any dish as a sweet, desert garnish.